Yvonne is coughing all night and I am bouncing from side to side – fancy Walmart latex ear plugs don’t help me too much. Unfortunately, all good cough suppressants are grade C drugs – not recommended for pregnant women. Isn’t life fun? The morning greets us with the sunny warm winter day and the temperature in the low fifties. The wind drives notorious Beijing smog away and even the horizon is sharp and clear. 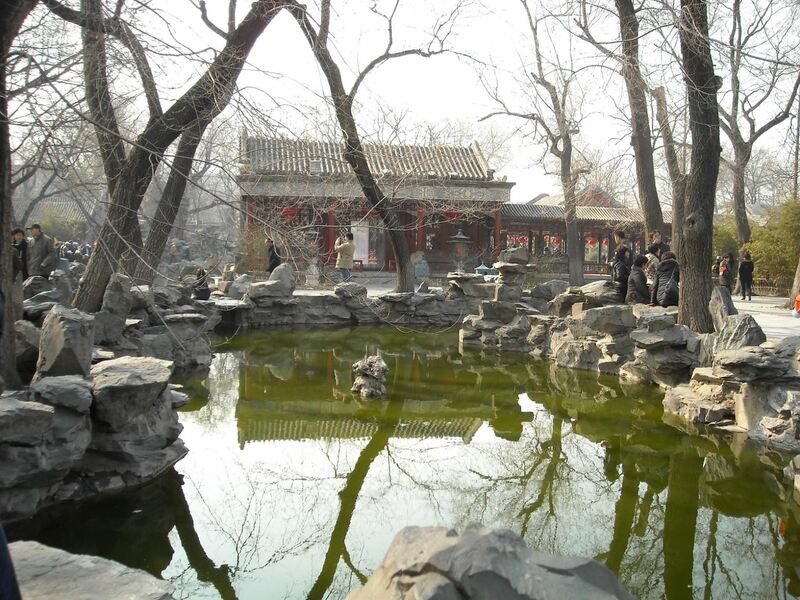 We have already been to most major museums in Beijing but Lonely Planet offers us a nice option – to visit Prince Gong manor, supposedly an interesting surviving example of a classic Chinese private residence. We spend a couple hours wandering around the place; our feelings are mixed. This is not a residential accommodation that I hoped to see. This is a bona fide palace, like the Forbidden City but on a smaller scale. A classic Chinese courtyard style building complex is organized accordingly to the deep philosophical principles of Confucian ethics and feng shui. To a white barbarian like me, it just looks like a rectangular maze of narrow passages, barely fit for a Walmart cart to squeeze through, low walls and rectangular two story buildings. Winter Beijing sun sits too low to shine into the courtyards and it’s a bit chilly in the shade. A few Chinese tourists wander aimlessly around the courtyards, just like us, dressed in ubiquitous down jackets and looking slightly cold. The place has been renovated and it shines with bright colors. White washed passage walls are lined with black stripes. Bright red columns and door frames flank the buildings and blue green and yellow multi-tiered wooden corbel frames support the tiled roofs. 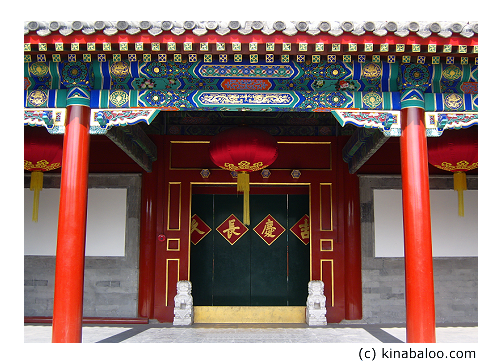 Chinese color scheme is very warm and it makes even the most pompous buildings look friendlier and softer. Lots of wooden elements also help. As we wonder around, we learn some about the history of the place. Thankfully, most texts are translated into flowery and somewhat awkward English. The translator tried very hard to do the justice to a complex and poetic Chinese text using an Oxford dictionary. The result is often entertaining but not quite comprehensible. Still, it’s helpful. As so many other buildings in major Chinese cities, the palace suffered a destruction in several stages. At first, European liberators used large caliber naval artillery to ensure open trade in China. Then, “there were some other disturbances after WWII”, as the text obliquely refers to the Communist government making an air conditioning factory out of the manor. Then, the building suffered in disrepair and neglect till early 2000’s. Before the Beijing Olympics, the Chinese government had run major renovations of historical places all around China. The maze of courtyards ends, bringing us out, into the park. Every self-respectful Chinese manor has a park with a lake, to get closer to nature, the mother of all things. Following – what else – Confucian ethics, the park is very simple and close to nature – every blade of grass, stone, and tree are carefully arranged with a perfect precision worthy of a computer chip factory. The natural perfection of Chinese landscaping always remind me a natural looking Hollywood haircut – the one that takes a few hours by a high end hair stylist. It does achieve its purpose though; Yvonne and I enjoy the ultimate serenity that the place projects. Like two cats next to us, we luxuriate in sun’s thin warm light. Then, the fragile tranquility is shattered by a fifty person tourist group obediently following its microphone armed guide. Yvonne grinds her teeth as she translates the barking and hissing loudspeaker. I laugh and pet her slightly convex belly, in a counterclockwise fashion. We are so lucky to travel out of season. Three months later there will be dozens of tourist groups slamming into each other and enjoying the ephemeral beauty of blossoming tree under the screeching soundtrack of ubiquitous megaphones. We leave the manor and wonder around old crooked streets, ducking into three feet wide alleyways framed by hundred year old one story buildings. This one of a few surviving old Beijing neighborhoods. We peer into open doors and windows; the condition of the buildings varies a lot. Some of them have doors and passages almost too narrow for me to squeeze through and I am thirty pounds lighter than an Average American guy. Some of them have been repaired quite thoroughly and wide gilded doors go together with new carved window frames. I enjoy this place so much more than Prince Gong’s manor. As I grow older, my touristy preferences are slowly shrinking in size. At twenty, I was drawn to the biggest palaces I could find, Gothic cathedrals and wide open boulevards Baron Haussmann’s style. Now, I would rather spend time wondering around the narrow alleys of an old neighborhood, snooping into people’s lives. Too bad, I don’t know Mandarin! 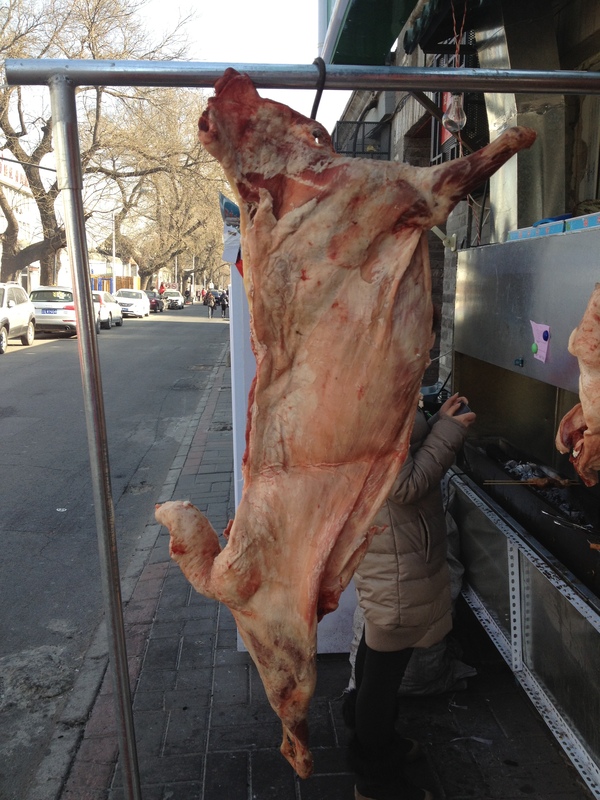 We wonder for a while and then we pass a half of lamb hanging of a meat hook next to a grill. The sweet smell of roasted meat reminds us, it’s time to eat. The photograph above demonstrates the power of foreshortening. This is actually a smallest cutest lamb I’ve ever seen, it is barely two feet long. As their religious brethren all over the world, Chinese Muslims know a thing or two about lambs. Lamb chops on a stick, covered with a mix of cumin, Szechuan peppers and chilies, grilled over real wood charcoals – I want to cry, that’s how good they taste. The biggest modern art museum in Beijing brings us nothing but disappointment. I suggest changing gears and checking out the biggest rock climbing gym in Beijing – I am very curious about the emerging local climbing scene. Also, by a pure accident I happen to have a pair of La Sportiva climbing shoes in my backpack. We walk into the gym, the size of a large American living room, and two things immediately become evident. Firstly, the climbing has only just started its triumphal procession among twenty million people of Beijing. Secondly, to our delight, climbers are the same everywhere. The familiar smell of climbing chalk and stinky climbing shoes permeates the bouldering room. A dozen skinny Chinese dudes and three skinny Chinese girls are hanging out on the foot thick floor mats. A young skinny German shepherd mutt is tied to a bench with a piece of climbing webbing and a biner. Yvonne rushes towards the dog and, for a few minutes she becomes oblivious to everything else. I start climbing. The same plastic holds, the same routes, the same walls. It’s as if I didn’t just fly seven thousand miles over the Earth. A guy offers me chalk – I didn’t bring any. Another dude shows me how to do a difficult move on a route. I try it but fail – his stretching is two inches better than mine. We laugh ruefully. They speak virtually no English and I speak no Chinese beyond hello and thank you. It doesn’t matter, we climb. This entry was posted in Travel 2014 by borisitin. Bookmark the permalink.